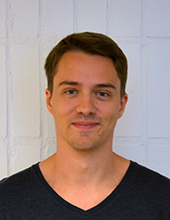 Arni Alfredsson is a PhD student in the Communication Systems research group. His research focuses on digital signal processing for spatial-division multiplexed transmission in systems employing multicore, multimode, or multiple single-mode fibers. There might be more projects where Arni Alfredsson participates, but you have to be logged in as a Chalmers employee to see them.